Alarm clocks came early on departure day. We had a 5:30am breakfast scheduled and we wanted to maximize the energy we filled our bodies with before our hike back out of the canyon. It was still pitch black outside so I went out and grabbed a few last shots of the stars while my brother gazed at the early morning sky and the smell of bacon filled the air. The weather was probably about mid 5os and the skies clear so we anticipated a warm day ahead of us. 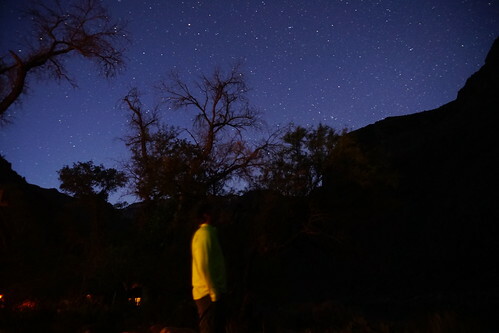 We awoke on day 2 with clear skies, warm temperatures and achy muscles. All the stoves were fired up to get some coffee going and some breakfast so we could get outta camp and explore. But we were all having such a good time just hanging out in our little back yard that we didn’t do much exploring till later in the morning. Our first expedition was about 30 feet away at the canteen where we ordered more coffee, played a game of No Thanks (Joe picked up a hat trick with his win on this game) and sent off some postcards. We finally got up enough oomph to head out of camp on a little walk (we decided there would be no hiking today, just walks). Thirteen months ago my Uncle Rick contacted me to tell me that he had scored 2 nights at Phantom Ranch at the bottom of the Grand Canyon and that I was invited! With about 50% of my life already behind me I quickly accepted the invite, put it on my calendar and readied my pen to mark this off my bucket list. Those thirteen months flew by and it’s time to do this thang! Friday night my brother and I drove down to stay with my folks in Colorado Springs to save us a couple hours driving the next day. 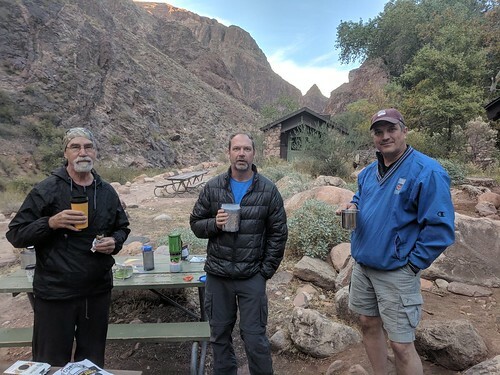 We awoke bright and ugly on Saturday morning, snarfed a bite of breakfast down and threw back a couple cups of java before picking up my brother-in-law Todd, life-long friend Tom and Uncle Rick. Two rest stops, one lunch break, 3 filling stations and 12 hours later we rolled into the Highland Country Inn in Flagstaff AZ to rest up before our long trek into the canyon. Thank you for stopping by our travel blog! What you will find here are a collection of stories we have written about our travels as a family since 2015. I wish I could tell you that you were in for some epic adventure tales about an extraordinary family who, against all odds and set backs, set out to explore the world as nomads on a mission to love, live and learn. I mean, I could tell you that and not be lying at all. But I think you would then find yourself disappointed after getting into our story and think to yourself, “that’s not so special…we could do that!” So that is what I want to tell you…you can do [insert your own crazy pipe dream here]!! You will never be totally prepared. You will never be totally ready. At some point you will just have to go for it and jump. And, once you become the main character of your own tale, the adventures you have will be epic and you will find that you have an extraordinary set of co-stars to help you overcome the odds and get past the setbacks on your very own mission. If you do want to read our story you can start at the beginning* and read about our travel preparations (in chronological order) which included some very non-ideal vehicle issues but ultimately led to us taking the jump to in-dependence. From there you can read about our travels from then to now. You can also learn a little bit more about us, see some stats, some photos and a map of our travels. Our 6:00 wake up call came early to Caden and I as both of us had trouble getting to sleep. But we knew that an early start meant cooler temps for hiking, that the mosquitoes were sleeping in and, if we finished our hike today, there was a big juicy burger to be had!! 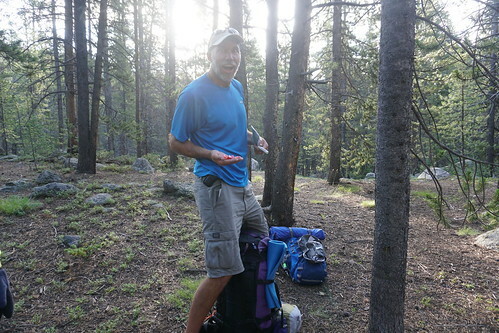 When I got out of the tent Joe pointed to our food bag. It had moved about 3 or 4 feet with some drag marks leading back to where we had put it the night before. Clearly some creature had tried to make off with it. I can imagine the thing working so hard to nick it then finally giving up saying, “you’ve got to be kidding, what kind of idiots carry THAT much weight in food through the woods.” That would be us! Joe woke us up at 6:00 so we could get a head start on hiking while the temperatures were cooler and, as it turned out, the mosquitoes were still asleep. The stove was definitely acting up and just barely got our water warm enough to have some luke warm coffee and cocoa. We stuck with cold poptarts instead of trying to eat luke warm oatmeal. 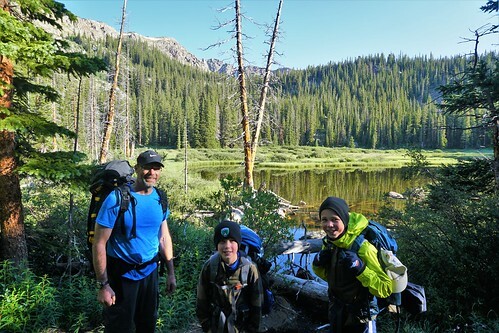 We packed up and said goodbye to Bear Lake as we began a long steady ascent through forest and around a couple of ponds. We slept in a bit this morning in an effort to try to catch up on sleep after our early morning yesterday. While we ate our breakfast and swatted mosquitoes both boys said they laid awake last night thinking of good people for Infinite Questions. My old self hardly even remember laying down I fell asleep so quick! I awoke to Caden’s voice right over my head. It was 4:05am….even the roosters were still asleep. “My stomach is killing me!” he said. Every once in awhile Caden gets a really bad stomachache. Steph and I both got up to try to help him out but not sure our efforts would be fruitful or not. 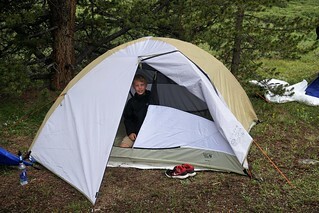 Regardless, he made it clear he still wanted to go backpacking as he figured it’d go away after several hours like it usually does. I woke Dacen up at 4:30 and then Joe showed up right on schedule at 4:45. We loaded backpacks in the car, said goodbye to Steph and we were off. 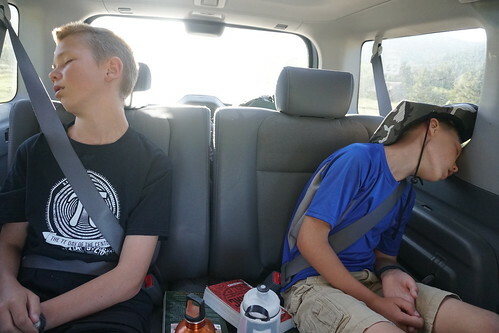 Caden’s stomach issues subsided soon after we left and before long both boys had fallen asleep in the back of the car for the 2.5 hour drive. 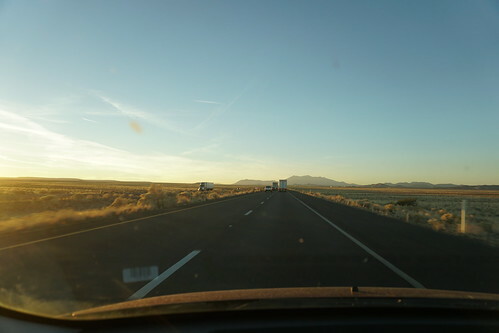 We got up and around early again and were on the road at 8:38am for our last leg of this adventure. If all went well we would be home about 3:00. 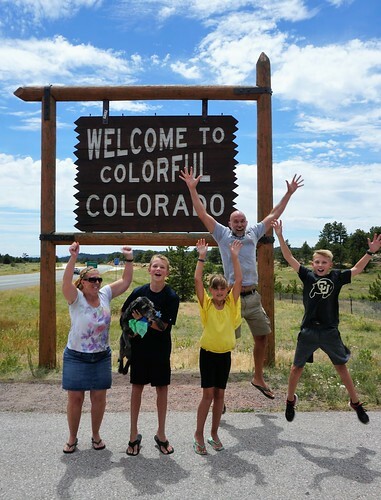 We took a fuel and restroom break in Rawlins then stopped for lunch at the Colorado border.